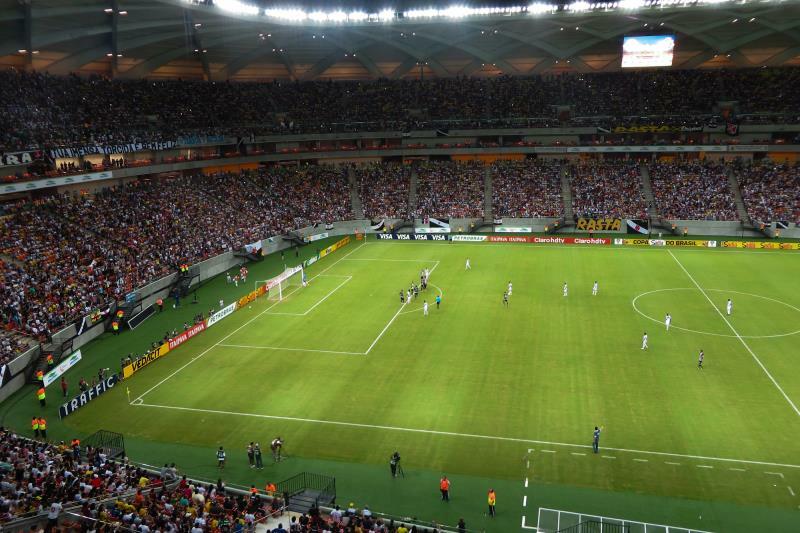 The Arena da Amazônia was built to serve as one of playing venues for the 2014 FIFA World Cup. It replaced the old Vivaldão stadium, which used to be the main stadium of the city. Demolition of Vivaldão started in March 2010 and in early 2011 construction began of the new stadium. The Arena da Amazônia was initially planned to be completed early 2013, but various delays pushed the opening back to early 2014. The Arena da Amazônia was designed by German architecture firm gmp Architekten, also responsible for Frankfurt’s Commerzbank Arena and Warsaw’s Stadion Narodowy. The shape of the stadium is meant to resemble a traditional indigenous basket and takes into account the area’s challenging climatic conditions. The roof’s steel structure is designed to serve as a large gutter that drains the tropical rain water, the roof’s coating reflects heat radiation and thus has a cooling effect, openings in the roof and facade stimulate ventilation, and there are ample areas of shade where spectators can shelter from the sun. 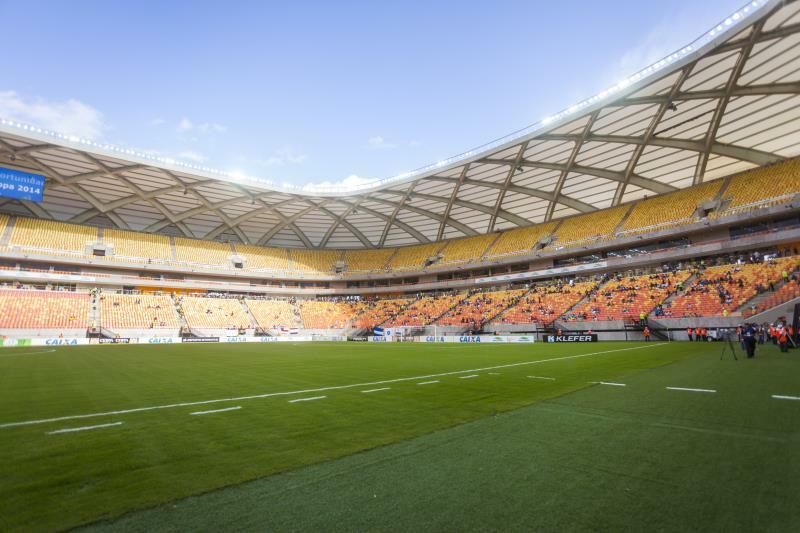 The Arena da Amazônia officially opened on 9 March 2014 with a match between Nacional FC and Remo (2-2) for the Copa Verde. The former will become the permanent occupant of the stadium, while it may also get occasionally used by other local sides. 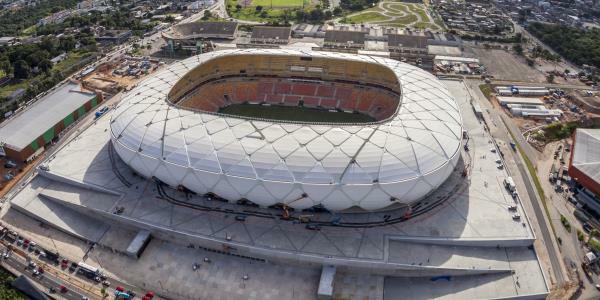 During the 2014 World Cup, the Arena da Amazônia will host four group matches. The Arena da Amazônia is located toward the north of the city of Manaus on the main road that leads from the city centre (Centro) to the international airport. The distance from Manaus city centre and the Amazon river is a little over 5 kilometres, while the airport lies 7 kilometres further north. 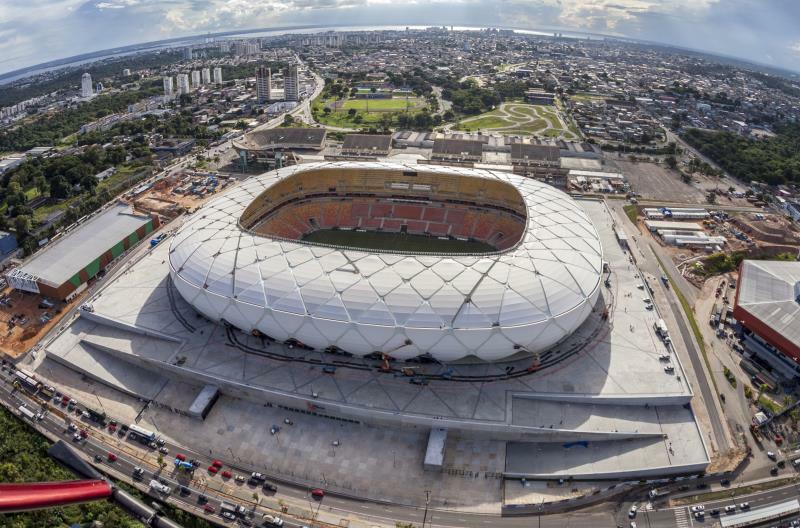 The Arena da Amazônia is located on one of Manaus’ main arteries in an area that is a mix of other sports and entertainment facilities, such as the local Sambadrome, retail, light industry, and some residential buildings. There is the typical roadside fare around if you are looking for something quick to eat, while the nearby Amazonas Shopping Centre (15 minutes walking) has some fast food as well. Overall though, the area is of little interest and eating and drinking is better done in Manaus’ not unpleasant city centre. There are a few hotels within walking distance of the Arena da Amazônia. Both Cesar Business Manaus and Hotel Millennium get very good reviews and are less than 15 minutes walking from the stadium. Otherwise there are a few more hotels on the way to the centre, and plenty more in Manaus’ city centre, which is also where most of Manaus’ nightlife is. Click here for an overview of hotels near the Arena da Amazônia and here for the options in Manaus’ centre. Finally, you could opt for a resort style hotel in the upscale Ponta Negra area, which, though further away from the Arena da Amazônia, offers the pleasure of an Amazon river beach and some restaurants and nightlife. Tickets for Nacional games can be bought online through Ingresse.com, or in person at the Arena Amadeu Teixeira next to the Arena da Amazônia. Expect to pay around BR$50.00 for a regular seat or BR$100.00 for a VIP seat. Nacionalfc.com.br – Official website of Nacional Futebol Clube. Arenadaamazonia.com.br – Official website of the Arena da Amazônia.